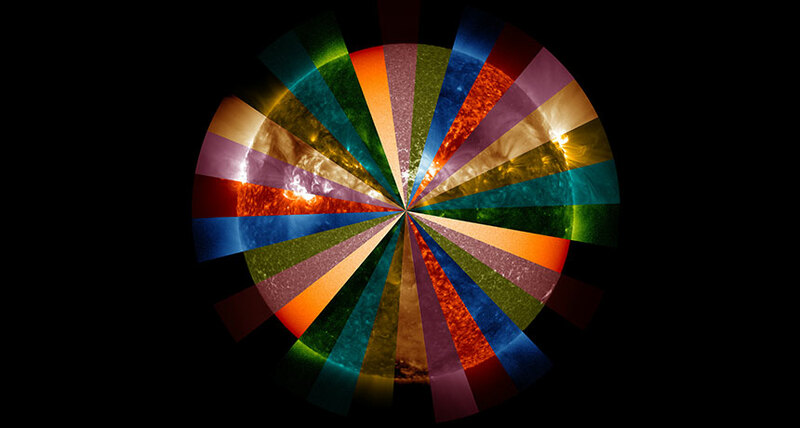 THE RAINBOW CONNECTION Comparing observations of the sun in many wavelengths of light (shown here in a set of observations from NASA's Solar Dynamics Observatory) with those of sunlike stars shows that our home star is surprisingly unique. BOSTON - Many sunlike stars are eerie clones, but ours is an individual. A study of solar twins reveals that the sun's chemical makeup is surprisingly different from that of its nearby peers, while those stars are almost identical to one another. Since a star and its planets are made from the same materials, that may mean the exoplanets orbiting those stars come in just a few flavors. It also could point to a new way to discover stars with solar systems more like ours. Astronomer Megan Bedell of the Flatiron Institute Center for Computational Astrophysics in New York City and her colleagues studied the elements in 79 "solar twins" - stars with nearly the same temperature, gravity and iron content as the sun. The stars had been observed with the HARPS planet-hunting telescope in Chile, which measures stars’ spectra, or the rainbow of light emitted across different wavelengths. Subtle shifts in the light can reveal an orbiting planet. Spectra can also reveal the abundance of specific elements that make up a star. "This dataset is really a treasure trove for abundance analyses," Bedell told the Cool Stars 20 meeting on July 30. Bedell's team measured the abundances of 30 elements to 2 percent precision, higher than previous studies had been able to achieve, and confirmed that some elements vary with a star's age (SN: 10/1/16, p. 25). That was what they expected - younger stars probably formed from clouds of dust and gas that had been polluted with more heavy elements from supernova explosions. But the ratios of certain elements that are key to planet formation, such as carbon to oxygen or magnesium to silicon, were nearly identical across the stars in the survey. Stars and their planets form from the same original cloud of gas and dust, so the star's chemistry represents what its planets are made of. The relative amounts of magnesium and silicon in a planet can determine everything from whether a planet has a rocky crust to if it has plate tectonics to what kind of minerals it forms (SN: 5/12/18, p. 28). Earlier studies had suggested that there was enough variety in stars' compositions for an exotic zoo of exoplanets. But with this group of stars, Bedell's team found the opposite. "Past studies have said that there is a lot of diversity from star to star, so there should be a lot of diversity among planets," Bedell says. "We're seeing a lot of the same." But not when it comes to the sun. The team found that the sun's elements come in subtly different proportions. For example, the sun is missing about four Earth masses worth of rocks and metals - the very elements that the planets are made of. That result could be because of the solar system: The elements are missing from the sun because they're locked up in the planets, Bedell says. There's another, less savory possibility: The other stars might contain more rocky elements because they once had planets, and ate them. Only a minority - 7 to 20 percent - of the stars measured by Bedell's team matched the sun. No planets have been found orbiting those stars. "Of course that doesn't mean that they don't have planets, just that we can't see them yet," Bedell says. Searching for other stars that share this shortage of rock and metal elements could help astronomers find other solar systems like our own. The work "shows that we can do high precision abundance measurements, which are vital" for figuring out a planet's composition based on its star, says exogeologist Cayman Unterborn of Arizona State University in Tempe, who was not involved in the study. He thinks there's still room for exotic exoplanet compositions to exist, though - other stars that aren't twins of the ones in this group could have different chemistries. "The fact that the sun is depleted relative to these stars is VERY interesting, though, especially since some element abundances are pretty critical for planetary evolution,” he wrote in an e-mail. "Worth exploring!"